During my last visit to the bazaar, I bought a stunning Uzbek rug. 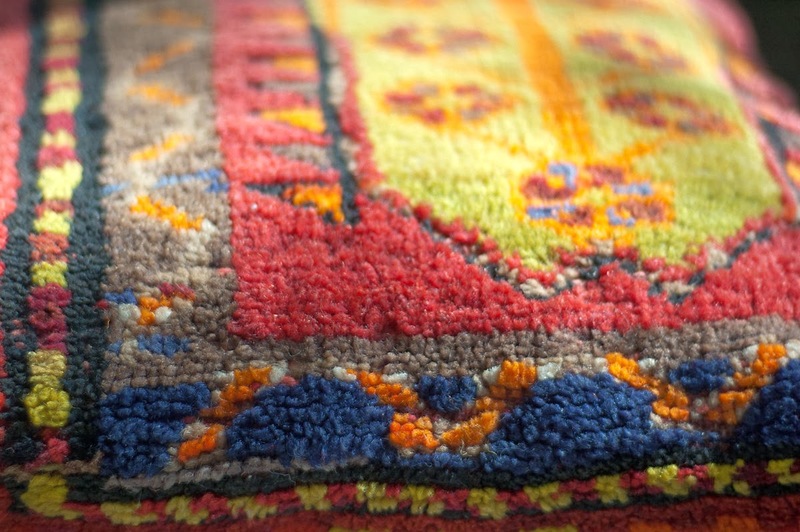 It was a vintage rug made in the city of Chust, Ferghana Valley, Uzbekistan. The pile on the rug was quite high and had the typical silky sheen of high quality wool; it was also very soft to the touch. But it was the palette that attracted my attention first of all: rich raspberry pink with mustard yellow, taupe, indigo blue and grayish green. They are so much in tune with autumn - think harvest; orchards full of ripe fruits and piles of corn and pumpkins. The design is also unusual in its barbarian boldness, with large shapes and lots of sharp angles. The rug was somewhat damaged at the edges. I considered mending it and just using on the floor but then decided to make beautiful rug pillows from it. You can see the first one here (and you can buy it in our Etsy shop), and I just love how it turned out! There will be six altogether, and all of them will be lovely, although slightly different - coming from different parts of the rug. How do you like it? To me, this is a wonderful example of self-taught artists' freedom in using colors and shapes. The true ethnic spirit is present in every line and streak of color. 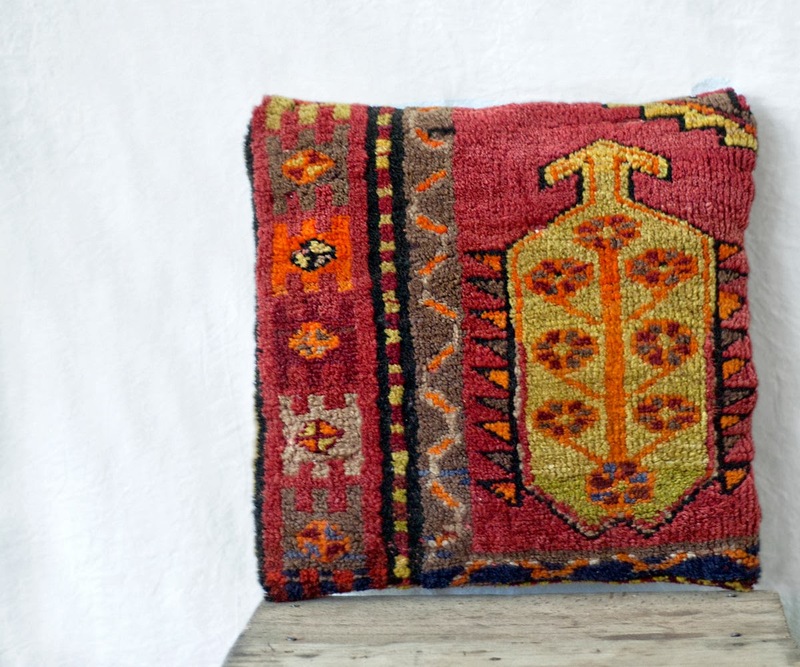 I know little about carpets coming from that part of Uzbekistan, but I certainly loved this one, and these rug pillow cases seem to be the best we have had so far. I am still not sure if the decision to make pillows from the rug was good, but now it is too late to regret. 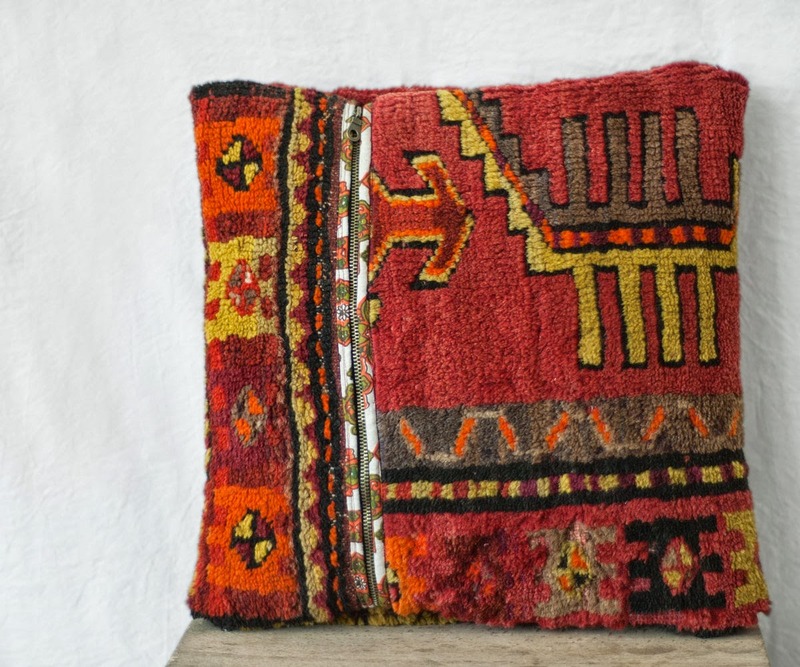 However I might keep a rug cushion, or maybe two... they are so unique and beautiful - it will be too hard not to keep a piece of this beauty to myself. Your rug pillows are very pretty, I love them. Great job! M+D Old New House for small rugs, pull down maps and more vintage decorative items!